Hello everyone! So sorry I haven't had a post in a few days, I have had a very busy and fun Halloween weekend! Today's post is just a quick NOTD. 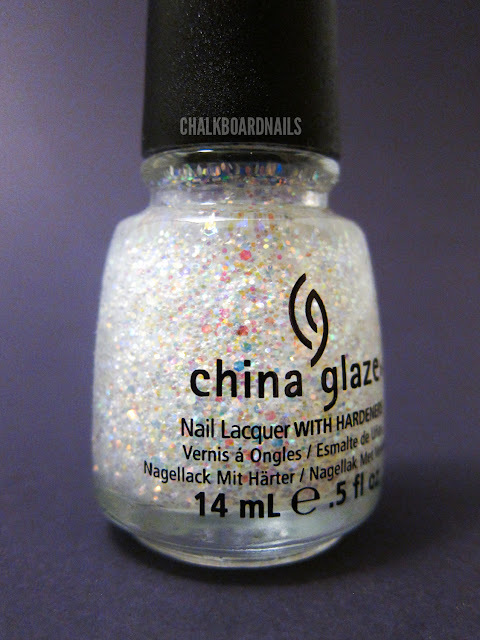 I got China Glaze's Snow Globe this weekend on a little haul excursion. It's from the new winter collection, called Let It Snow! The store that I got it from only had one left, and I of course snatched it right up. I wasn't sure what to do with it, though! Should I put it over a lighter color, a darker color, matte, shiny... there were too many choices! I tried a few combinations out on a nail wheel and ultimately decided on this. I started with a base of China Glaze Liquid Leather. Then I added one coat of Snow Globe (yes, it's this dense in one coat), and finished off the mani with a coat of China Glaze Matte Magic to make the nails matte. The only thing that I don't love about this manicure is that putting the glitter over black really makes it lose its delicate quality. It's a trade off though, because the bright colors of this glitter really pop over black. Did you make it this far? Since I don't have many photos for today's post, I'm including a shot of me in my Halloween costume! I was a Day of the Dead senorita. My roommate Dayna of Light and Sugar did my makeup, and I felt so fabulous. She did a great job! I spy my Helmer filled with polish in the background! I am so glad I have Snow Globe on its way to me! And your makeup is AMAZING! SO, SO gorgeous mani! <3 Snow Globe is totally on my WL from now on! That is sooo pretty! I love glitter but I hate wearing it just because of the torture of taking it off! I have a friend who had that kind of costume, love your take on it! That polish is soo pretty! I love how versatile glitters like that can be! And I love your sugar skull makeup!! The polish look really great matte, I wasn't really feeling it as is. 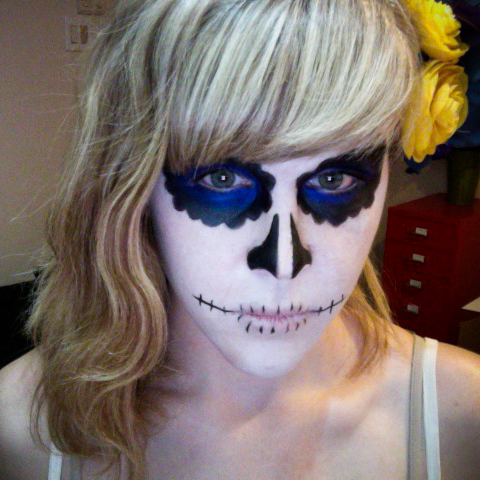 And I LOVE your Day of the Dead makeup!!! I'm always a big fan of glitter over dark colours! Sarah this is awesome, and I love your makeup!!! Very pretty makeup!!!! And I have that polish. It's my new fave.